WELCOME to FOX & Cie, toys for life! A company of 11 specialty boutiques that offer quality products through personalised and friendly service. Our 11 independent shops came together to highlight quality toys and games and to offer a real alternative with positive, meaningful quality. 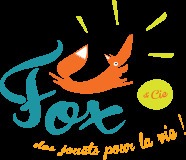 Come into one of the 11 FOX & Cie shops, where you will marvel and discover a wide selection of items for toddlers from birthday presents to the so-called edutainment games, board games, and construction toys that stimulate creativity, develop motor skills, along with beautiful toys in wood, fabric.... in short, toys for life! Fun: Fun in playing, being together, sharing, discovering new things. Wonder: Inspire wonder through our shops and our available toys and games. Service : Offering the best service. Authenticity: We offer true relationships and real, authentic items. Quality: Ensuring permanent quality both for our service and the items we select.